Despite booming commodity markets and rising farmland prices through parts of the 10-year period ending in 2011, Canada lost 969,802 hectares of class one, two and three farm land, a recent Statistics Canada report on agriculture and the environment says. Much of the total farmland loss occurred in southern Ontario and Quebec and reflects urban, population growth in the Great Lakes and St. Lawrence River watershed. It’s part of a well recognized, national trend since 1971 that has seen the loss of 3.9 million hectares of prime farmland, an area roughly the size of Vancouver Island, the report says. “Obviously it’s a very concerning and ongoing trend,” said Ontario Farmland Trust executive director Matt Setzkorn in an interview about the Stats Can study. At the same time, StatsCan data may not reflect either the impact of changes since 2005 in Ontario farmland protection or the rising real estate value of land for agriculture, University of Guelph rural planning professor Wayne Caldwell said in an interview today. Caldwell is director of the university’s school of environmental design and rural development. He and his students have begun a detailed study aimed at measuring the success of new, Ontario planning measures since 2005 in slowing the rate of loss of prime farmland. Those measures include Green Belt protections for 720,000 hectares of land surrounding the greater Toronto area and adjacent to the Niagara Escarpment. As well, the province has introduced policy statements in 2005 and 2014 designed, among other things, to strengthen protection of prime farmland throughout the province and to concentrate urban growth within defined boundaries. “What I think we’ll find in all honesty is, since 2005, . . . lesser numbers of (development) applications approved in the case of the Greenbelt within the protected countryside and in terms of class one, two and three land elsewhere,” said Caldwell who has 25 years experience as a land use planner in Huron County. Written by a group of six analysts and titled Agriculture in Canada, the StatsCan report was released Nov. 13 by the federal agency’s Environment, Energy and Transportation Statistics Division. It relies on data from the most recent Census of Agriculture for 2011 and is part of a broader study called Human Activity and the Environment. “As Canada’s population grows and cities develop and spread outward, the loss of some of the country’s best farmland will likely continue given that many population centres are located near some of the best farmland in the country,” the report predicts. The report highlights particularly urban growth in the Toronto-centred region known as The Golden Horseshoe, home to as much as 26 per cent of Canada’s population. 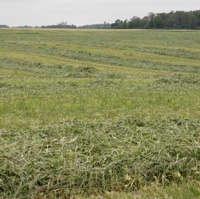 It puts at risk farmland resources that are “the foundation for our economy here in Ontario,” Setzkorn said, referring to the strong position of Ontario agriculture as part of the national, farm economy. Advantages of top quality soil and the Great Lakes’ region’s relatively mild climate create a diverse agricultural sector capable of growing crops that don’t grow elsewhere, Setzkorn said. “Ontario is a real cornerstone to Canadian agriculture, consistently the leader in gross profits and gross farm receipts so the permanent loss of that agricultural resource is hugely concerning, not only locally in Ontario but for the province as a whole and the country,” he said. Caldwell’s current research is designed to provide greater detail about actual land uses than is provided by the StatsCan data. Development over the past 10 years relied on planning decisions made over the past 25 years. Caldwell hopes to learn how planning adjustments since 2000 have affected actual rates of conversion to other uses from agriculture. Provincial policy directs increased density of development in both urban centres and rural communities, he said. That should reduce development pressure on farmland. As well, the rising value of farmland in recent years should affect development calculations. Much of the province – notably, Oxford, Huron and Perth counties – has seen significantly increased real estate value for useful agricultural land. “It changes perspective at least as it relates to the question `Do I want a severance on my farm, a lot, for example, when the land might be worth $20,000 an acre as farm land?’” Caldwell said. Also as part of StatsCan’s Agriculture in Canada project, analysts studied data on a variety of agricultural environmental indicators. The report shows fewer farmers and larger farms as well as greater reliance on commercial fertilizers, pesticides, herbicides and fungicides. Since 1971, the number of farmers in Canada declined 44 per cent from 366,110 to 205,730. As a result, average farm size has increased from 188 hectares to 315 hectares. In 2011, 69 per cent of Canadian crop farms applied commercial fertilizers. As well, 69 per cent of crop farmers reported applying herbicides. Lower numbers reported use of fungicides (23 per cent) and insecticides (15 per cent). The analysis shows agriculture as the main source of ammonia (NH3) emissions in Canada. Between 1985 and 2011, ammonia emissions from agriculture increased 29 per cent from 354,480 tonnes to 458,051 tonnes. CO2-equivalent, greenhouse gas emissions from agriculture in 2012 amounted to 56 megatonnes, eight per cent of Canada’s total. However, the widespread adoption of no-till, field management techniques in recent years has turned Canadian cropland from a net source of greenhouse gas to a net sink, the report says. No-till tactics avoid mechanical soil tillage by having farmers sow seed directly into residues of past crops. No-till increased in use from seven per cent of farms in 1991 to 56 per cent in 2011. Why has no one imagined limits? Stop... no more... go build on the gravel further north. Or discourage any 'growth' at all. Where could I find the stats can study?